All too often it seems that the most important lessons in our lives are made apparent during times of death. After the death of Steve Jobs I posted an article (Found here) that attempted to share some lessons gleaned from his final days. I treated his passing as a singular event worthy of comment. In recent days the specter of death has made its dark presence felt again and again in the world of sports. In September we bid farewell to long-time offensive coordinator Mike Heimerdinger. After that we mourned the loss of football legend Al Davis. Most recently we learned of the death of Dan Wheldon, the winner of the 2011 Indy 500. Death can be easy to ignore when it doesn’t occur close to you personally but sometimes it reaches out and grabs you. That’s what happened to me when I heard that Mike Heimerdinger passed away when I was watching Sportscenter one morning while getting ready for work. The broadcast included this statement from Mike Shanahan, coach of the Washington Redskins. After someone dies it is common courtesy to think of their family and to speak highly of them, to have respect for the dead. That is obviously not what this statement is trying to do. It is obvious how highly Shanahan thought of Heimerdinger. When a guy is willing to admit that someone is their best friend then it is a testament to how close the two are. This was a shock to my system for an odd reason. I’ve always disliked Mike Heimerdinger. He was the offensive coordinator for the hated Tennessee Titans from 2000-2004 and again from 2008-2010. His name was very distinctive, so it was easy to remember that it was his play-calling, his god-awful, ugly, power-running, tight end loving play-calling that helped the Titans beat my beloved Jacksonville Jaguars so frequently. There wasn’t a single positive thought in my head about his existence. Then he died, and I heard Shanahan’s quote and it shook me. Not only does Heimerdinger have a best friend, but he has a family and every one of those people is grieving just like I have when I lost people in my life. Even in a selfish world that’s a wakeup call. I thought about it all day. It’s a wakeup call about the people around me; they each have their own story, their own experiences, and their own families. Even If I don’t know those things about them and even if they choose to keep those things private it doesn’t mean that they don’t exist. I’ve said a number of times that we’re all the center of our own world, the hero in the play of our lives. Whether or not the play of our life is a tragedy or a comedy is largely determined by our actions, but either way, we’re the hero of the story. I think it’s very healthy to step out of that everyone once and a while and remember that everyone else is the hero of their story as well. I think it’s important to remember that and treat them with the respect that they deserve. Al Davis was 82 years old when he died. He was already well aged by the time I started paying attention to the NFL. I’m somebody who likes to look at the past and learn from him, but I had never paid attention to his career. By the time I knew him by name he was nothing more than the eccentric old owner of the Los Angeles Raiders who liked to cause trouble and wear ugly glasses. It’s an eye opener to learn when someone dies that they accomplished more before you were born than you have accomplished since. I think that there are number of lessons that we can learn from Davis’ life, both positive and negative, but the one that sticks with me right now is the lesson of age. 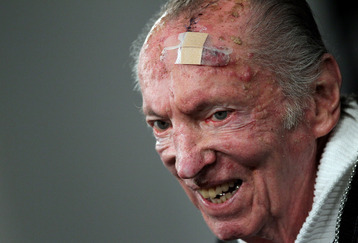 There was nothing physically attractive about Al Davis over the last few years of his life. He was the kind of person that you would probably choose to avoid looking at if you had the choice. But he wasn’t always like that. When he was younger Davis was just a normal looking guy, he may not have been the handsomest person you’ve ever seen but how many of us are? Davis reminds me of my Granny, my grandfather’s mother. When I was very young we would visit her. She seemed so old at the time, wizened and wrinkled. As a very young person I was almost scared of her, I didn’t really want to touch her. I didn’t exactly know why but there seems to be a reticence on the part of the very young when they come in contact with the very old. Maybe it’s as simple as the physical changes like wrinkles or liver spots. Looking back on this I am completely ashamed. This was one of the elders in my family, one of the people who was responsible for who and what we would become. Now as an adult I wonder about her life. She must have been in the prime of her life during the great depression. She may have even been born before the turn of the century! I wonder what those things were like and how the world looked to her in her old age. It’s a subtle change that happens as we get older. As time goes by we have the chance to personally see people grow older. We are better able to comprehend why certain changes are happening and what they represent. Now, as an adult, when I see people in their 70’s and 80’s I understand that they weren’t always like that. Shoot, when I was a child they were only in their 50’s. That’s not so much older than I am today. It pains me to think that someday when I’m aged that I might be rejected by my own grandchildren or great grandchildren based on nothing more than my appearance. At that point I will have spent a lifetime preparing the way for them. I will have made hundreds of sacrifices and hard decisions so that they could have a better life and be raised well. To be rejected by such a child on the basis of looks would be heart-wrenching. Yet I know that I was this very child just 30 years ago. I think that Al Davis’ death reminds us of the value of our elders. They are living through a very difficult period of their lives where time grows short and the body grows weary. For us to compound that struggle by being unappreciative of their sacrifices and their lives is the height of immaturity. I know that it isn’t easy to teach children things that go counter to their natural inclination. There are some things that are easier to teach than others. That being said, I think that we owe it to ourselves to teach them respect for their elders. More importantly, we need to teach them who their aged family members are and why they are special to us. If we do not, then it won’t be long until we are the aged family member who feels rejected by the very people that we gave our lives for. Dan Wheldon was 33 years old when he died in an accident at the Las Vegas Motor Speedway earlier this month. His life was snatched away in the flower of his youth. In my mind this is the most heart breaking of all of the deaths mentioned in this article. Wheldon will miss the experience of a long, fulfilling marriage. He’ll miss the experience of raising children and then seeing them interact with the world with the lessons and training that he provided. Then on the other side of the coin he has been snatched away from his parents, friends and family. He was the joy in their lives and they will never get to enjoy the person that he was going to become over the course of his life. I’ve had a difficult time comprehending his death. Many times when an accident happens you’ll hear somebody say something like, “I just saw him this morning”. In this case we all saw him that morning. There is footage of him smiling and talking just before the race. Then, out of the blue, he’s gone forever. It’s easy to become introspective in situations like this. Am I ready for the moment of death? I know by faith that I am ready spiritually but it still frightens me greatly to envision myself lying on a bed, closing my eyes and leaving forever. I’ve written numerous times about the way that the knowledge of death should influence the way that we live our lives, so I won’t belabor the point here. All that I really want to do is give us all a reminder. It is easy and natural for us to ignore our own mortality. But the fact remains that I will not live forever. Neither will you. Even more importantly is the reminder that we don’t know when it is going to happen. It’s easy to assume that you will grow old, but that time is not promised. Dan Wheldon woke up Sunday on a race day just like any other. He had no idea that his number had been called. We won’t know ahead of time on the day or night that our number is called either. All we can do is live the life that we want to live while we are alive. We need to live our lives with no regrets. That means something different to everyone. I know that I’m going to be meditating on what it means for me in coming weeks. I need to make adjustments to how I spend the time that I’m given. I need to address the things that I might regret with action while I still have the chance to do it. I hope that you will do the same. Posted on October 22, 2011, in Personal Development and tagged Al Davis, Dan Wheldon, Death, Life and Death, Life Lessons, Mike Heimerdinger, Mike Shanahan, NFL, Old Age, Sports Deaths. Bookmark the permalink. Leave a comment.